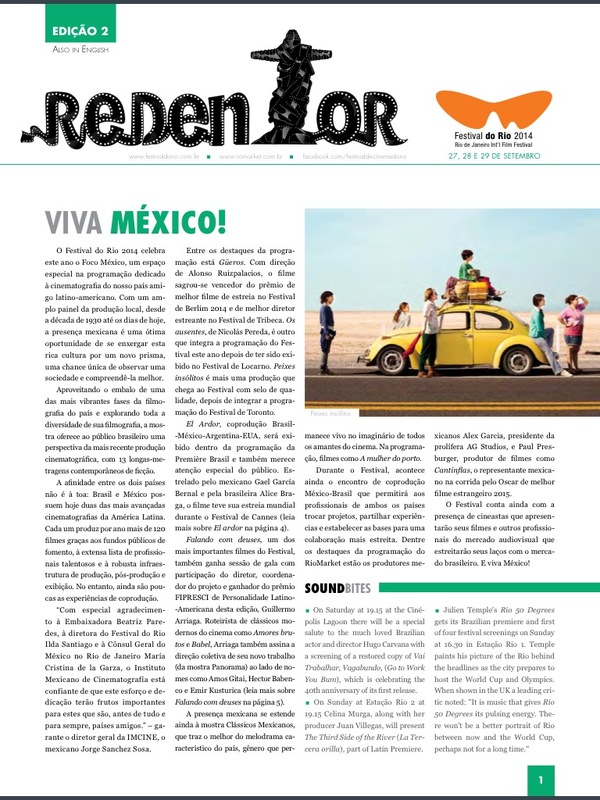 One of the most highly anticipated Brazilian films of 2019, Vicente Amorim’s The Division (A Divisão), has been introduced to international buyers during the 2019 Berlin Film Festival. Amorim was also helped on The Division by José Junior, Creative Director and CEO of AfroReggae Audiovisual (the film’s production company), who has created and produced several television series for channels in Brazil such as Multishow and GNT, including Urban Connections (Conexões Urbanas). He was also the producer of the multi-award winning documentary Favela Rising. The Division is AfroReggae Audiovisual’s first feature, and in Brazil it will also be expanded into a multi-part TV series for Globosat. Festival do Rio coincides this year – as it does every four years – with Brazil’s presidential election and the elections for the National Congress, state governors and state legislatures. The elections take place on Sunday, Oct. 5 and voting in Brazil is compulsory. If none of the candidates obtains over 50% of the valid votes, a second round will be held on Oct. 26. Incumbent President Dilma Rousseff of the Workers’ Party (PT) is running for re-election. But she is challenged by 11 other candidates of whom Minas Gerais Senator Aecio Neves from the Brazilian Social Democracy Party (PSDB) and Marina Silva from the Brazilian Socialist Party (PSB) are her main rivals. Just over a year ago, it was assumed that Rousseff’s re-election would be something of a stroll in the park for her and her party, and she would easily pass the 50% required at the first time of asking. But then came the protests. Quiet at first, but rising to a violent crescendo where it was openly discussed if Brazil would be fit to host the 2014 FIFA World Cup. The protests seemed to cover every possible theme and topic, and embraced every age group and social background. 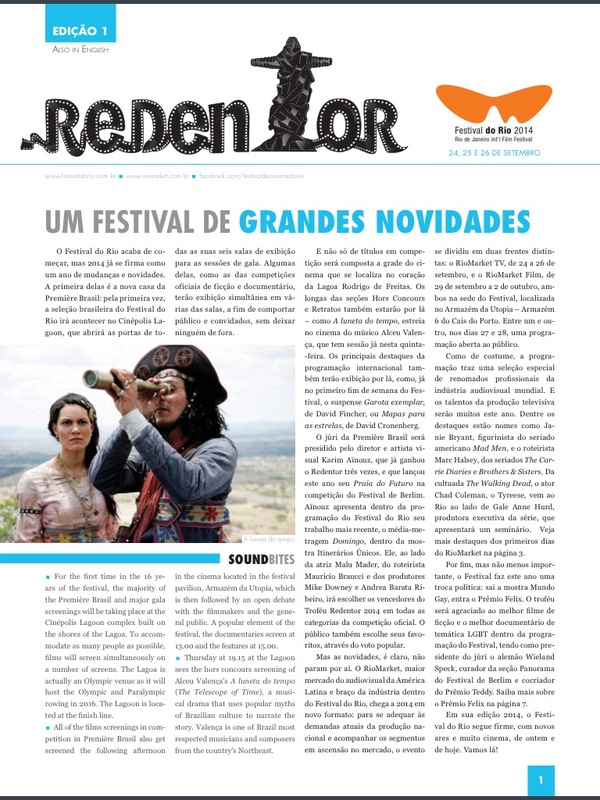 They even disrupted last year’s Festival do Rio screenings at the Odeon Petrobras in Cinelandia as its location was a focal point for protestors. Yet it could be said that this is all history, as the protests diminished and Brazil went on to host one of the most successful – some would say “the” most successful – World Cup. The president was still booed at the matches she attended, but so was FIFA president Sepp Blater. Rousseff may have been hit and wounded, and accusations of her party’s corruption and incompetence continued to grow, yet her opponents still looked far from likely to upset the apple cart or the gravy train that many of her party workers appeared to be riding. Opinion polls gave Rousseff a comfortable lead over her main rivals, but it now started to look as if she would not get the magic 50% required in the first round, yet this would be a temporary blip as she was almost certain beat her most obvious opponent in the second round, Aecio Neves. Yet everything changed when the original PSB candidate, Eduardo Campos, died in a plane crash in Santos on Aug. 13 The party quickly chose Marina Silva, who had been his running mate and who had run for the presidency on her own party ticket four year ago, to replace him. The bounce in the polls was dramatic, more than any Hollywood screenwriter would dare to script, and riding a wave of emotion the PSB saw its poll ratings jump in days from less than 10% to over 33%, passing even the president’s rating. Polls also showed that if Silva and Rousseff were to face off, Silva would be a comfortable winner. But Brazilian voting patterns are nothing if not volatile, and in recent days the concerted negative attacks on Silva by the president and her party machine has seen Rousseff re-take the lead. Yet if Silva can stop the president reaching 50%, there will still be all to play for in the head- to-head in the second round. So what does the election mean to the film industry and culture in general? Globo, to its credit, did attempt to bring culture into the presidental debate by asking all the three main candidates questions on cultural issues that had been set by cultural big hitters including Barreto, actress Patricia Pillar, musician Ivan Lins, director and actor Domingos Oliveira, and the director of Porto Cine, Adailton Medeiros, among others. What was abundantly clear from the answers was that not one of the candidates had given much weight or thought to cultural issues, with the answers being penned by their political advisers and spin-doctors. If you could spot a trend in the replies it was that the current president thinks she and her government have been doing a great job, so don’t really need to change their position; Silva placed culture in with education, so issues were viewed for their educational impact rather than cultural or financial impact; while Neves said he would like to see a more private-public business partnership in developing Brazil’s cultural sector. It is unlikely that any party has won or lost votes on its cultural positioning, but voters may have noted that the artistic community that once flocked to support the ruling PT when Luiz Inacio Lula da Silva was its charismatic leader and president, have been shifting to support Silva. The most vocal, not surprisingly, are the more successful artists that don’t need to go cap in hand to the government for support and funding. Highly respected musician Caetano Veloso has been very vocal in his support for Silva, explaining to the public and his 1.5 million Facebook followers why he thinks it is time for a change with a vote for Silva. The most surprising switch of allegiance – and potentially more damaging – has been that of Veloso’s fellow musician and friend, Gilberto Gil, who was Lula’s high profile Minister of Culture. He too has switched to Silva and has even written a campaign song for her. The public support of cultural figures may not influence the outcome of the first round of voting on 5 October (although a week out from election it was estimated that as many as 20% may still be undecided), but it could make a real difference in the run up to the second round on 26 October. Especially if they are willing to share the hustings with Silva and become even more vocal in their criticism of the existing government. Another prominant supporter of Silva is the film director Fernando Meirelles (“City of God”) who is promising to bring his very considerable marketing clout and experience to the electoral party and produce some promotional spots for the second round when Silva would have equal air time on television with Rousseff. Ex-president Lula, who hand picked Rousseff to succeed him, can be only too aware that it was a Meirelles short promotional film that helped swing the vote for Rio to host the 2016 Olympics, and beat other cities that had appeared to be the clear front runners. On a more local front, the Brazilian film industry is probably quietly pleased to see the current governor of Rio, Luiz Fernandes do Pezao of the PMDB, recovering in the polls and looking well placed to win at the second round of voting for governor of the state of Rio. His predecessor, Sergio Cabral, was recognized as having done a lot for the city and state, in term of both the World Cup and Olympics, and security, but was dragged down by a number of scandals that resulted in various measures and funding to support the film industry, including the Marca RJ announced in Cannes, never coming to fruition. There will be hope that some of these support mechanisms and funding will be reinstated should Pezao win the election. Overall, filmmakers in Rio can look forward to two years of relative stability, as that is how long the current mayor, Eduardo Paes, has left in office. 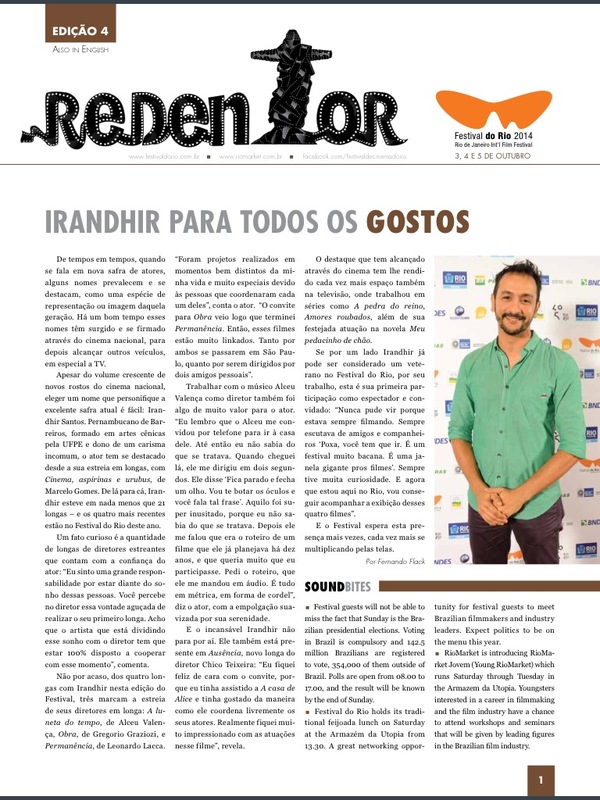 It is the mayor that funds RioFilme and the Rio Film Commisssion, and makes Festival do Rio possible. Ironically, there were political protests again at the opening of this year’s Festival do Rio, but all fairly good-natured. The protest was by filmmakers who are accusing the mayor and governor’s office of only supporting commercially interesting projects rather than artistically driven projects that have little chance of making their money back. An argument that will be familiar in many countries, yet Brazilian filmmakers may have to re-think their position as in 2013 a healthy 120 Brazilian films were made and released, yet less than 20 found an audience of any note to help the domestic share of the box office creep above 18% of tickets sold. It is unsustainable, especially to politicians, to fund so many films that fail to find an audience. 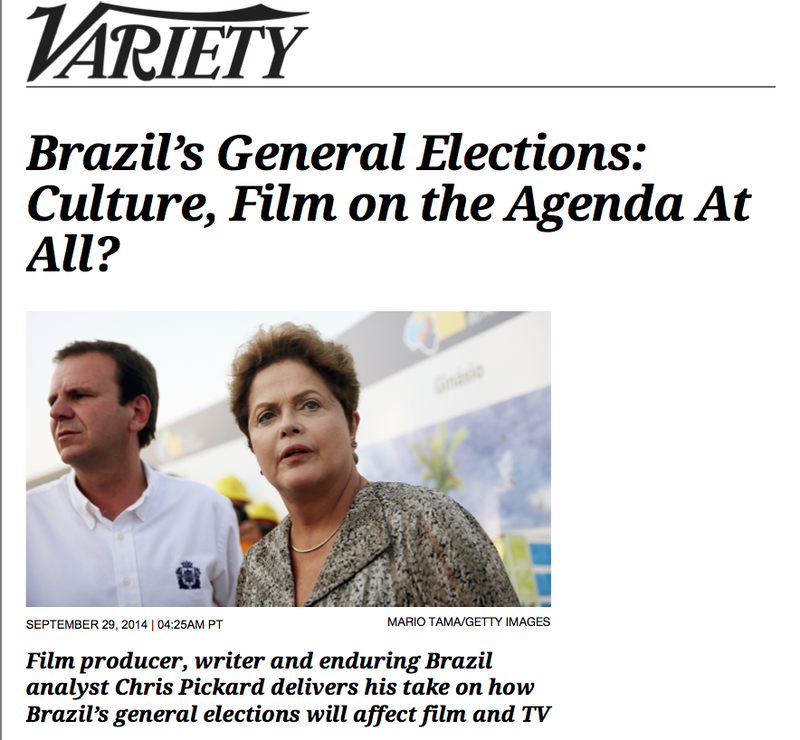 While non-Brazilians filmmakers who deal with Brazil will watch the elections with interest, their main wish, regardless of who wins, will be to see less bureaucracy in Brazil and clearer rules and transparency when it come to the taxation levied on film projects on a municipal, state and federal level. Many foreign producers have been caught out in the past 18 months by extra taxes asked for by Brazilian production companies and partners on costs that were not included in the original budgets. Brazil needs to simplify the filmmaking process and the time it takes to process funding requests if it wants to attract more production and to benefit from the exposure the country received during the World Cup and will again in 2016 with the Olympic and Paralympic Games. The question now is if the next president or governor of Rio will show more interest in culture and filmmaking when in office, than during their campaigns. RIO DE JANEIRO — Critical Divide’s Chris Pickard, a veteran not only of Brazil but also of the Rio Fest and RioMarket, has unveiled a bevy of Brazil-based projects under the banner of The Sound of Brazil. Pickard, who was responsible for the original idea and for co-producing Julien Temple’s “Rio 50 Degrees,” which has screened at the Festival, told Variety he aimed to have most of the slate ready to air in 2016, the year of the Rio Olympics and Paralympic Games. He is hopeful some may even be ready for 2015, when Rio celebrates its 450th anniversary. The season of music documentaries and performance films is being developed with the BBC in the U.K., and other international broadcast partners. 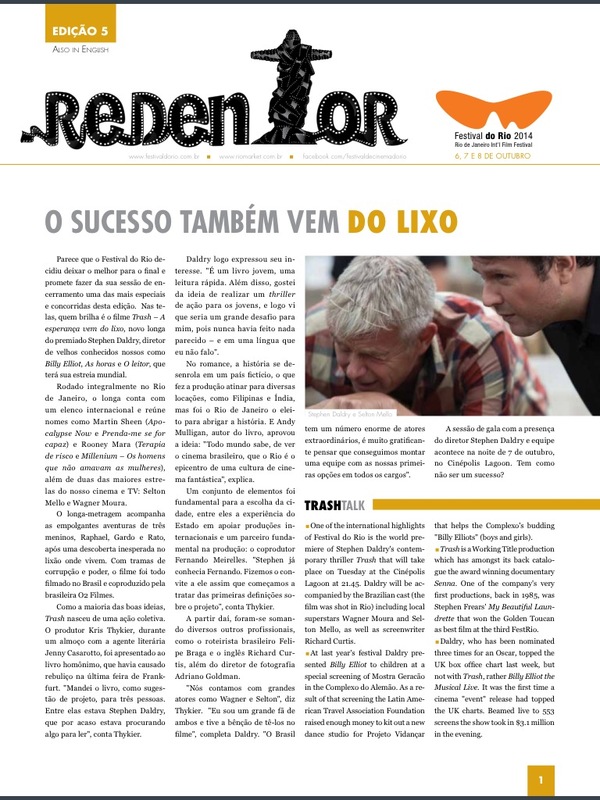 Films look to build on the growing cultural partnership that started to develop between Brazil and the U.K., and especially Rio and London, during the 2012 London Olympics. With the ever-closer cultures of Brazil, the U.K. and Europe in mind, a first project comprises a three-part series looking at the evolution of musical culture – and dance- in Brazil from the arrival of the first missionaries to the very latest sounds and musical talent. For the U.K. and certain international markets the programs will be presented by Katie Derham, the face of classical music at the BBC as well for the BBC Proms. Derham, like Pickard, has long-standing family ties with Brazil. Partnering Derham and Pickard in developing the season are James Joseph of Creedence Productions , a highly respected and well-connected music and entertainment lawyer whose management company, with offices in London and Los Angeles, looks after Nina Simone, Cleveland Watkiss, Cassandra Wilson and Julian Joseph, amongst others, and Mark Barrett, ex-head of Classical Music at BBC Worldwide Music and previously Classical Manager Europe at Sony Music Entertainment. A number of Joseph’s clients have toured Brazil and worked with Brazilian artists in Brazil as well as in the U.S. and Europe. He has also filmed programs and projects in Brazil with Fernando Meirelles and O2 Filmes. One of those larger projects, which Joseph expects to have wide international appeal, is a special “homecoming” concert in Rio de Janeiro for musician Sergio Mendes. It would include many leading international and Brazilian names that have collaborated with him over the years, including talent featured on the soundtracks of Fox’s animated films “Rio”. There will also be a full standalone documentary about Mendes who was the artist who took Brazilian music global in the 1960s, and is often better known internationally than in his own country and city. 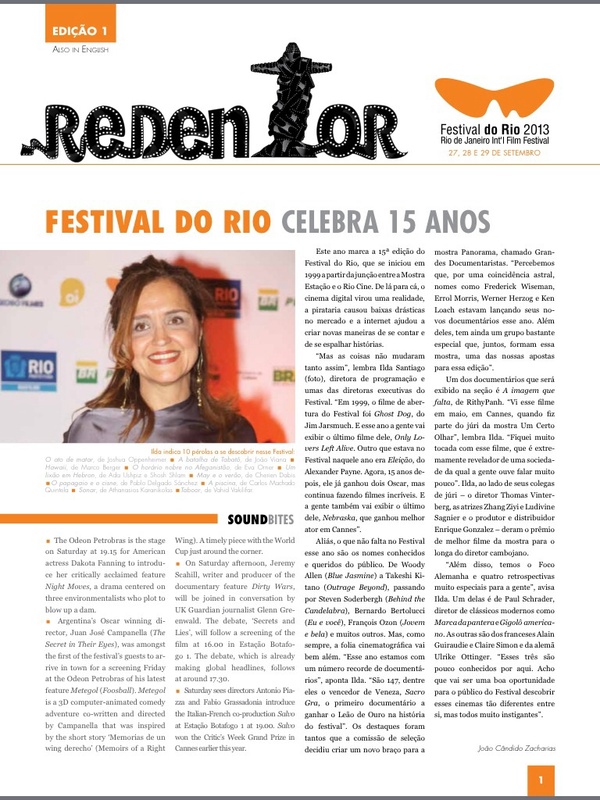 “We hope to stage the concert in 2015 as part of Rio’s 450th anniversary celebrations and then have the programe and documentary ready to broadcast in 2016 which will be the 50th anniversary of the launch of Sergio Mendes, plus Brasil’ 66 by Herb Alpert,” Pickard explained. The most ambitious part of the slate turns, however, on a program series is a series that will introduce and showcase Rio’s Carnival parade by parachuting six major international names into the city’s iconic event to mirror certain elements of the parade. Pickard first developed the project with the late Gus Dudgeon, Elton John’s producer for many years, who realized there was no accessible TV title to capture a larger audience and explain what actually happens in artistic terms with the parade. As Dudgeon noted, Carnival is more spectacular than any rock show he had seen, even Elton’s. “I have been involved with carnival for over 30 years – so I have form in this department,” Pickard says. “It is now a question of getting our final ducks in a row before more details can be unveiled as it requires a somewhat complex relationship of working not only with the Mayor’s office in Rio, but also the League of Samba Schools and TV Globo that so brilliantly film the parade to broadcast live over two nights to Brazil. 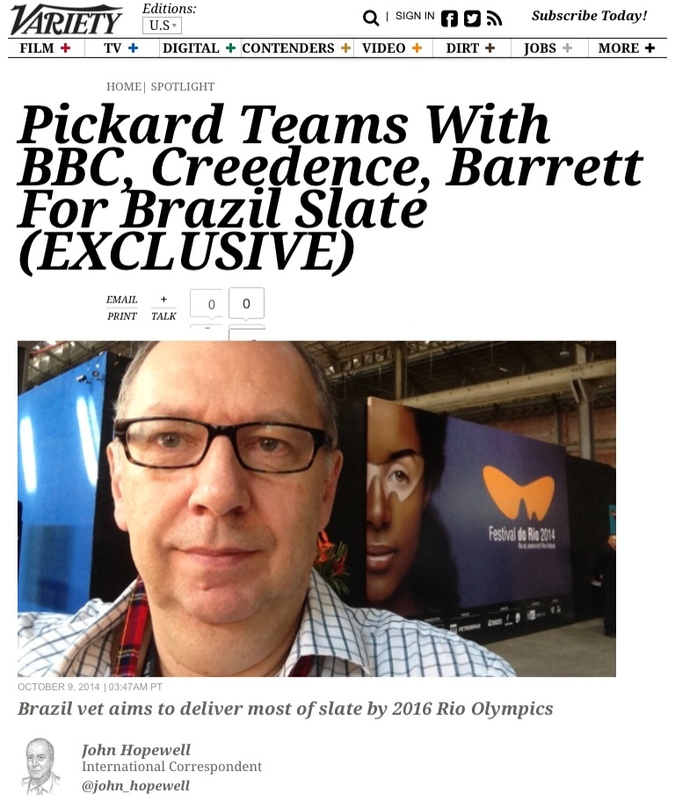 If Pickard and the team can get everything to align, they will look to film during carnival 2016 and have the edited shows ready for broadcast prior to the Rio Olympics that open on Aug 5 2016. Pickard held meetings related to the project while at the Rio Festival.